Sicily gives you the chance to live a wonderful holiday thanks to its history, sea, culture and food; surely one of the most popular tourist destinations is the Northwestern area of the island, where you will find the cities of Trapani and Marsala, and where we picked many of the Sicilian villas with private pool of our selection. The region of Trapani has a fascinating history: the Tyrrhenian and the Mediterranean sea meet right in front of the peninsula where the ancient “Drepanon” was founded – “drepanon” is a Greek word for “sickle”: the legend says that a sickle fell from the hands of Saturn and turned into the strip of land where the Elymians found Trapani. The city was once the port serving Erice, and became an important centre for the Greeks, the Romans, the Arabs and the Normans thanks to its strategic position. Today, Trapani is an elegant destination and an important touristic hub, thanks to its airport (served by the most famous European low-cost airline) and its port that connects the mainland with the beautiful Aegadian Islands as well as Pantelleria. Just 8 kilometers away from our lovely Villa Sicilian Dream, the city itself has really a lot to offer to tourists: a very elegant and lovely historic centre, with refined baroque buildings (from the Church and the Cloister of Capuchins to the Palazzo Cavarretta) and their typical sinuous wrought-iron balconies, interesting museums (don’t miss a visit to the Museo Regionale Agostino Pepoli, one of the most important art museums in Sicily) and picturesque restaurants serving fresh fish, cous cous and the typical “busiate” pasta with almond pesto. The ancient historic centre is perfect for a pleasant walk among narrow streets and antique shops, and to enjoy the sight from the seaside promenade; the embrace of the two seas can be best observed from the Ligny tower, located at the end of Viale delle Sirene (Boulevard of mermaids), on a terrace above the sea – a truly fascinating setting for breath-taking panoramas and colorful sunsets, with the Aegadian Islands (Favignana, Levanzo, Marettimo) on the background. Just a few minutes from the city centre lies the Nature Reserve of the Salt Pans of Trapani and Paceco: this place really deserves a visit as its beauty is really unique, and its peculiar environment makes it suitable for plenty of migratory bird species – pink flamingos and cranes above all. Salt pans are still in use nowadays, and have been used for at least 1000 years; together with the production of salt, they are famous for their dreamy and romantic atmosphere, thanks to the ancient windmills whose silhouette stands out against the million shades of sunset, and to the water reflecting those colors, creating an absolutely magnificent scenario that can be enjoyed every day. Sounds good, doesn’t it? 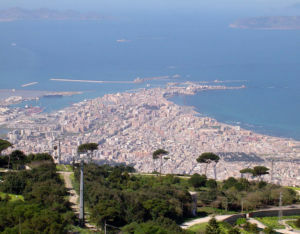 Check out our villa rentals in Trapani if you want to plan your stay in this area.